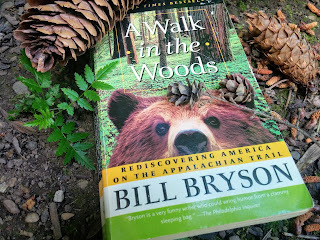 A Walk in the Woods by Bill Bryson is a humorous memoir about Bill’s adventure on the Appalachian Trail, a 2,180-mile trail that takes hikers through fourteen states (Georgia, North Carolina, Tennessee, Virginia, West Virginia, Maryland, Pennsylvania, New Jersey, New York, Connecticut, Massachusetts, Vermont, New Hampshire, and Maine). “Thru-hikers” are those hearty souls who actually attempt to complete the trail in a twelve-month period. The majority of people, however, are “section-hikers” and only walk portions of the trail at a time coming back year after year to begin again where they left off. Then there are the people who complete just a fragment of the trail and call it good. I’m not sure if they have an official title—maybe “Normal, Casual, or Even Lazy Hikers.” Bill Bryson, who is a well-known a travel/humor writer, was a thru-hiker working his way up the trail in one daunting year. On great chunks of the trail, his friend Stephen Katz accompanied him. Bill’s account of his time on the trail, the people he met, the challenges of the preparation and the walk itself, as well as his descriptions of his interactions with his walking partner, Katz, had me laughing through the entire book. Along the way, Bill throws in some statistics—actually lots of them—lots of factoids and bits of history. But these in no way weighed down the book. It was not Moby-Dickish in any way. I found them interesting and short enough so they didn’t become involved scientific or historical lessons. They were tidbits about the wildlife, the trail itself, or even towns along the way like Centralia, PA—wow talk about interesting. 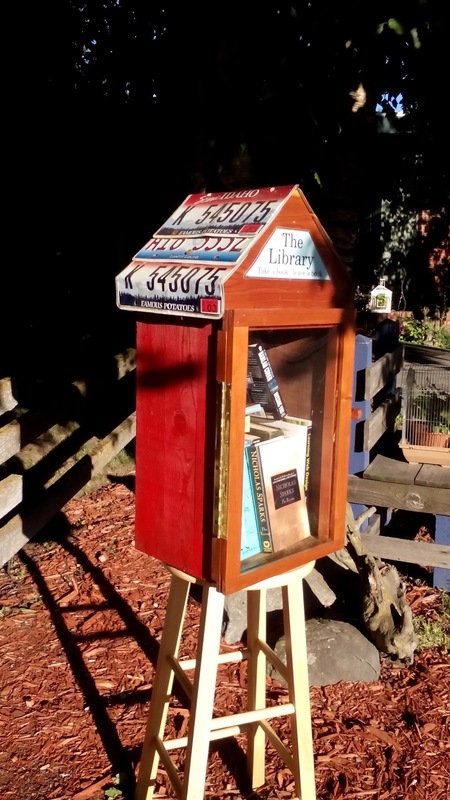 I found this book in one of the Little Free Libraries around town. The top section was all chewed up, as if the bear on the cover had taken a bite out of the book. In fact, there were teeth indents poking through the first couple chapters, kind of like bear braille. Normally, that would gross me out a bit. I would have passed on it and picked another book, but this was one I actually had on my wish list. So, I picked it up with two fingers, tossed it in the back of the car, and gave it a thorough disinfecting with rubbing alcohol when I got home--the equivalent to a scrub down of a radioactively exposed human, like Meryl Streep in Silkwood. It was worth the effort. This book was a walk on the funny bone. Bill Bryson, A Wallk in the Woods (Anchor Books, New York, 2007), 5. Want to learn more about Bryson's books? —check out Marianne's Let's Read blog where she's posted numerous reviews on his many books. Bryson is becoming my husband's go-to author, just like Sidney Sheldon and Isabel Allende were for my mom. Besides a Walk in the Woods, my husband also has read and has given thumbs-up to In a Sunburned Country; Notes from a Small Island; Neither Here Nor There; The Life and Times of the Thunderbolt Kid; and One Summer: America 1927. With the exception of One Summer, which was more informative than funny, these books had my husband laughing out loud! This from a man who considers "fine" and "okay" a compliment for books or movies he's watched. When he tried to read a passage from Neither Here Nor There to me, he had a hard time getting the words out. He was laughing so hard, he had tears streaming down his face. This book met a several of my 2015 Book Challenges: Read a memoir; read a travel book; read a book that makes you laugh out loud, read a book that will become a movie. I didn’t realize that this book was going to be a movie until I was almost done with it. In fact, the movie, starring Robert Redford and Nick Nolte is scheduled to be released September 2. I’m excited to see it. It’s gonna be a hoot! As you know, Bill Bryson is one of my favourite authors so I thoroughly enjoyed your review of this. Your story of picking up the book with two fingers gave me a chuckle. I've had these kind of books before, I usually put them in the freezer for a while (after disinfacting and in a plastic bag so they won't contaminate anything else). I read that somewhere and it gives me the good feeling that all the bacteria might be dead by then. LOL.